On the trail of the Wethersfield witch trials | You're History! The Webb-Deane-Stevens museum promo for our annual fall Witches and Tombstones program. Aired 10/18/14. 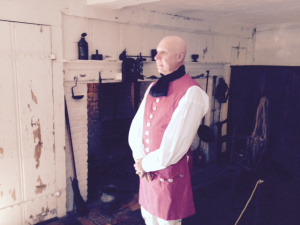 Just in time for Halloween, in Wethersfield they are bringing their haunted past to life. For the next two weekends the Webb-Deane-Stevens Museum is showcasing the Wethersfield witch trials in a tour around town called “Witches and Tombstones.” Among the objectives of the tour is to enlighten the public about the town’s dark past. The guides state that Wethersfield’s witch hunt happened about 30 years before the infamous trials in Salem. “It brings history alive and it give them some fun while learning a few things,” said Linda Pagliuco, a teacher and guide from the Webb-Deane-Stevens Museum. Tour stops include the Buttolph-Williams House built in 1711 and a walk through of the Wethersfield’s ancient burying ground, where you can learn more about the witch panic. “At the end of it all 18 people were accused and four were executed,” Pagliuco noted.